Sky is to be forced to stop charging the public service broadcasters (ITV, Channel 4, Channel 5, S4C and the BBC) for the pleasure of their customers having channels they have already paid for listed in the Sky Guide. Back on 29th August 2011 , UK Free TV reported about Paying Sky for free public service television channels. A report today, Connectivity, Content and Consumers Britain's digital platform for growth [pdf] from the Department for Culture Media and Sport says that Sky's "retransmission fees" must stop. Update: The BBC, ITV, STV, UTV, S4C, Channel 4 and Channel 5 all have contracts with the satellite owners, SES Astra to carry their channels on satellite. The phrase "retransmission fees" is an allusion to the position in the USA, where cable and satellite gatekeepers pay the broadcasters for their content. However, this dispute is over Sky charging the above programme creators and providers to have their programmes listed in the Sky Electronic Programme Guide. Sky does not in any sense transmit, or retransmit BBC, ITV, STV, UTV, S4C, Channel 4 and Channel 5 channels. all believe Sky are abusing their satellite-gatekeeper position, which much political agreement. PSB channels are brought to our living rooms by various TV platforms, such as Freeview, Sky, Virgin, and Freesat. Platforms benefit from having must-see content distributed across their services, while broadcasters benefit from having access to mass market audiences. But there is a growing debate around the payments that are made between broadcasters and platforms. The Government wants to see zero net charges, where the fees for access to the main platforms and for PSB channels cancel each other out. This is not too far removed from the current market position, and recognises the benefits to platforms, the PSBs, and audiences from being able to access award winning, PSB content. This mirrors the arrangement already in place for PSBs and cable platforms, where no charges are made - an arrangement that we want to see preserved. We are looking closely at how we can help achieve this without allowing other kinds of online services to exploit PSB content, with no benefit flowing to the PSB. We will launch a consultation on this in the autumn, before bringing forward legislative proposals if required. 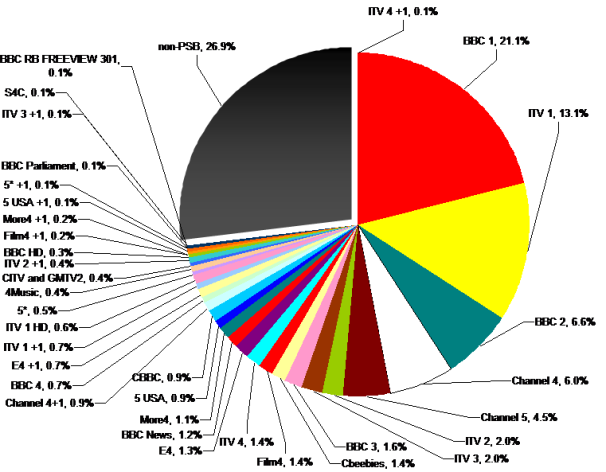 For example, almost three quarters of viewing of TV channels is to free-to-air channels provided by the main public service broadcasters, the BBC, ITV plc, STV, UTV, S4C, Channel 4 and Channel 5. Sky has already cut the costs - Sky halves EPG charges for public service broadcasters and saves BBC local radio. See also DCMS to abolish retransmission fees - News - Broadcast. My point still stands. if the BBC want to have a sky and a freesat epg they have to go through Sky's adaptation hub. As I understand it the streams that Sky sends though the hub is fairly basic now and then stream. Freesat is more complicated in that they use it for controlling PVR function as well as now and the data. So as I understand it Freesat is more dependent on these streams. I must admit I am not up todate on what Freesat streams control so things might have changed. As I understand it News International no longer exists. It was split into 2 companies 21st Centuary Fox and News Corp. I think 21st centuary Fox only has a 37% share in sky and Murdoch family has about 12% of that but I am not sure how it is split. So the argument that many people give for not having Sky because of Murdoch is a bit silly considering how small his interest is. Actually I guess your pension scheme probably has shares in Sky in any case. I have not seen Sky for a while but if setting up again it would be the first system to consider because of its for the user technically far better. I really hate the Freesat and Freeview box/TV makers being out of control and all operating differently. Sky boxes all the same to the user and with same remotes controls, updates happen automatically. As for the Freeview and Freesat program numbers and order they make no sense to me at least. David: just for the record all freesat boxes have the same epg. Had no experience of the various boxes for Freesat so not seen the EPGs, of course I said the numbers for Programs for Freeview and Freesat set by the 2 firms to be a strange allocation and to me neither are user friendly. Nest time I see a Sky and can have the RC for a few minutes I will see if Sky is better, I suspect they will be. David: I suspect the ease which which you find using an EPG depends on what your used to - if your used to Sky (which is avery good remote), then anything different will seem strange. Customers (often former Sky customers) report back that they find Humax's very easy to use, and my Sony is fine. Panasonic remotes have barely changed in the last eight years! Much the same debate goes on about tablets - if you've got an Iphone/Ipod, then an Ipad will be very easy, but if you have an Android phone, then an Android tablet will be very familiar - which one is better depends on what you want to do, and what your used to. The corporate governance of the group was long see as questionable, and the dynastic way in which family members became CEO's was controversial even before the phonehacking scandal. Rupert was both CEO and chair, and James was CEO & Chair (international) and deputy chief operating officer. Personally I think Sky should pay the BBC and itv to have their EPG data, not the other way around. Even though BBC/itv is provided free to air, Sky does sell access to BBC and itv channels via its equipment as part of its package, so they should pay "re-transmission fees" - even if it is only programme data. If the UK PSBs did gang up on Sky and demand that Sky pays them or they'll ask Sky to delist their channels from the EPG in their entirety - and carried through with that threat - I'm sure that there will be an awful lot of Sky subscribers who will be upset that they've lost access to the main channels they watch. Sky boxes would be hacked and all kinds of workaround be advertised on how people can get their "lost" channels back. Subscribers may choose not to renew. The PSB's can remind viewers that Sky isn't their only option. Personally I think that Sky only gains by having the PSB channels in their guide. After all, didn't TV listing magazines (after Radio Times and TV Times lost their listings monopoly) have to pay to get the schedules? The EPG is effectively today's Radio Times.